According to Michael Ashkenaz’s “Handbook Of Japanese Mythology“, Chikap Kamui is an owl kamuy or deity of the Ainu people. He is believed to oversee the behavior of humans … since the Ainu believed that the owl watched over the local kotan (domain), Chikap Kamuy came to be represented as the master of the domain. He is worshipped as a deity of material success. In some areas, his tears were said to be gold and silver. 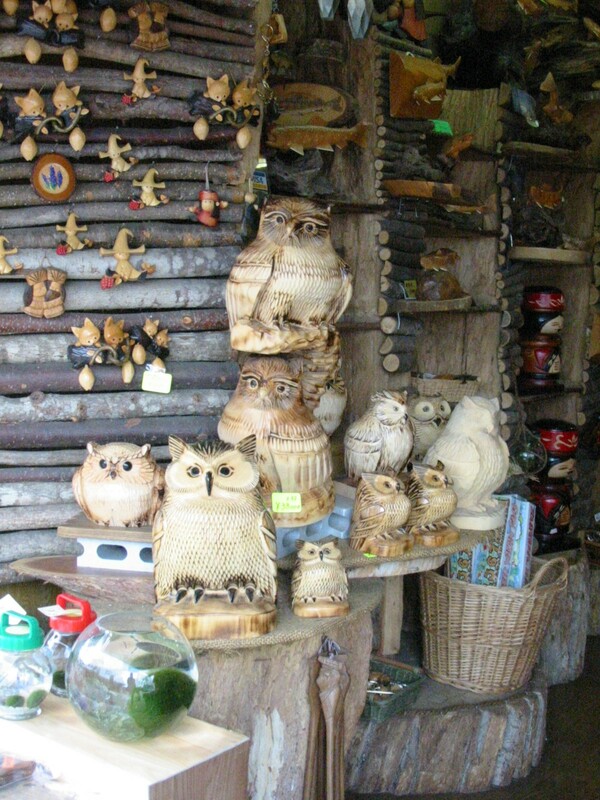 In our travels around Hokkaido, we had encountered lots of owl carvings and amulets especially at the Ainu Kotan Village at Lake Akan in Hokkaido. We’d also seen lots of owl amulets on the Izu Peninsula, and some homes around my neighborhood have owl pottery figurines on their gate, so my curiosity has been piqued as to what they might symbolize. When we were visiting the Maruyama Zoo in Hokkaido, at the aviary section I saw a plaque that said Japan was the “owl capital of the world” (I haven’t been able to confirm this by a google search but…) and it noted that there were around twelve species of owls indigenous to or that breed mainly in Japan. Japan seems to shares a Central Asian veneration of owls, as in Japan owl pictures and figurines have been placed in homes to ward off famine or epidemics. In Central Asia feathers of the Northern Eagle Owl (Bubo bubo), particularly from its breast and belly, were valued as precious amulets protecting children and livestock from evil spirits. Talons of the Northern Eagle Owl were said to ward off diseases and cure infertility in women. 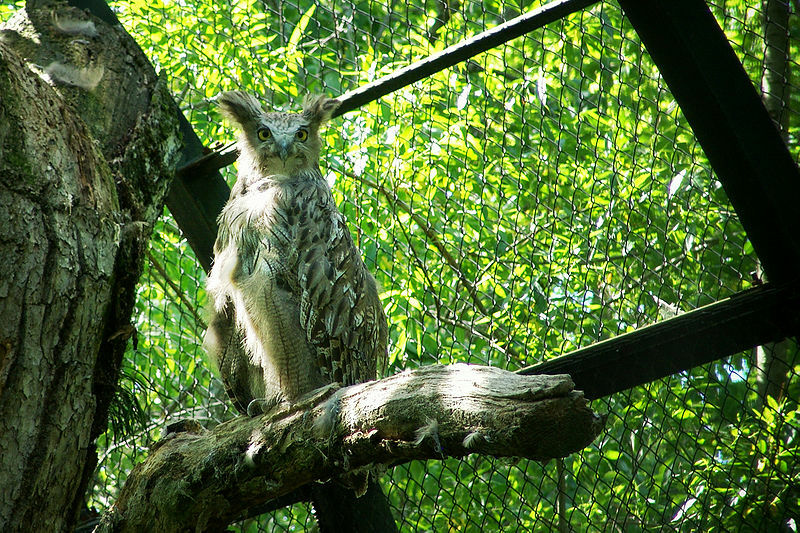 Also hinting of the antiquity of these beliefs – are the Ainu’s owl beliefs: the Blakiston’s Fish Owl (Ketupa blakistoni) was called “Kotan Kor Kamuy” (God of the Village) by the Ainu, the native peoples of Hokkaido, Japan. The traditional Ainu people were hunter-gatherers and believed that all animals were divine; most admired were bear and the fish owl. The owls were held in particular esteem and, like the people, were associated with fish (salmonids) and lived in many of the same riverside locations. The Fish Owl Ceremony, which returned the spirit of fish owls to the god’s world, was conducted until the 1930’s. Bird symbolism in Japan mirrors that of Central Asia and Siberia, since the tumulus age, there has been a persistent image of the bird as a bird of death. There are images of a bird on a prow in ancient etchings, tomb murals and funerary statuary. Although the chicken and flying waterfowl are more common imagery as the bird of death, the owl shares the same symbolic meaning. As in many cultures, owls signal an underworld or serve to represent human spirits after death; in ancient times along with other Siberian cultures, owls represented supportive spirit helpers and allow humans (often shamans) to connect with or utilize their supernatural powers. It is not surprising that with owls having been very common in the olden days and they are associated with shinto shrine groves, that there are several legends and folktales to do with owls: – see the Little Horned Owl (an Ainu tale) and “Colored” ; a really famous folktale about how the crow, originally a white bird, became black and “The Owl of the Three Jewels (from the nine gothic “Tales of Moonlight and Rain” by Ueda Akinari). According to some lore, some owls are seen as divine messengers while others, particularly Barn or Horned owls, are viewed as demons. On a more modern note, a Japanese Lucky Owl is one of the most popular lucky charms in Japan because ‘owl’ in Japanese is ‘fukurou’ which means ‘no hardship’ or ‘no trouble’. * フクロウ fukurō is applied to owls without ‘ears’, in particular the Ural Owl.